To convene, collaborate and lead. At the University of San Diego, we recognize that sharing experiences and living life with others extends beyond our campus. Catholic Social Teaching reminds us that it is through connection and the recognition of our humanity, that we go on this journey together. For USD President James T. Harris III, D.Ed., confronting humanity’s most urgent challenges begins in our San Diego community — by recognizing our role in addressing homelessness. As someone who experienced housing insecurity himself while in college, Harris understands the life-long impact homelessness can have. It sticks with you. The first step to addressing the problem is acknowledging USD’s role in solving it. On campus, organizations and individuals work to advance the issue and bring it to the forefront of discussions. From simply sharing meals, visiting shelters, or bringing faith experiences to others, USD’s efforts are widespread and heartfelt. Each month during the academic year, University Ministry staff transport student volunteers to the Rachel’s Night Shelter in San Diego, a mid-term shelter for homeless women. The evening’s purpose is to share a meal with the women and spend time getting to know them. For Coe, and those who experience these evenings, the family-style gathering showcases the common humanity and shared bond. Beaming faces and outstretched arms emphasize the impact it has. Warm food and conversation show these women they are not alone. 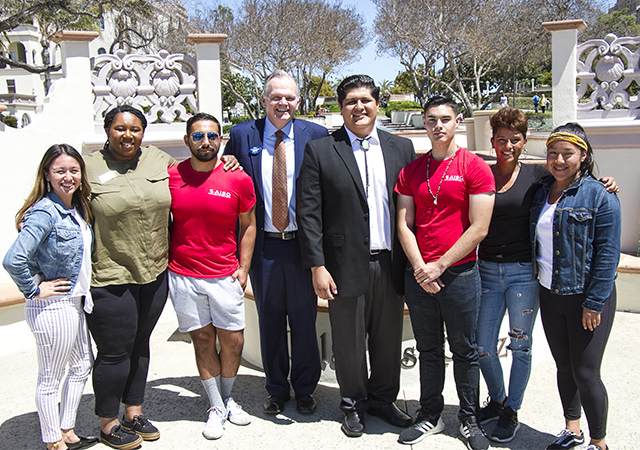 As a convener institution, USD is closely connected to the work being done in the community to address homelessness. This includes work being done by San Diego Padres General Partner Peter Seidler, a member of USD’s Board of Trustees, and San Diego restaurant businessman Dan Shea, to raise money and provide temporary housing for the homeless in the downtown San Diego area. Through the Lucky Duck Foundation, two large tents, one in East Village and another in the Midway district, have provided temporary shelter for some of the city’s homeless. Being in community with others contributes mightily toward better understanding. Each year, before the start of the spring semester, first-year students take part in the Romero Immersion Program facilitated by University Ministry. 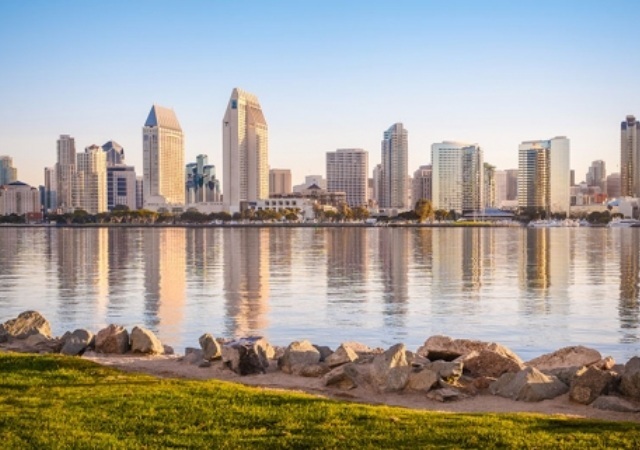 It’s a San Diego experience enabling them to connect with the homeless in the community, learning how this issue is related to concerns about affordable housing, healthcare, and hunger. This year, USD students spent time at the Rachel’s Night Shelter, Father Joe’s Village and visited the St. Paul’s Program for All Inclusive Care for the Elderly and the San Diego Youth Services Storefront Emergency Shelter for homeless youth. 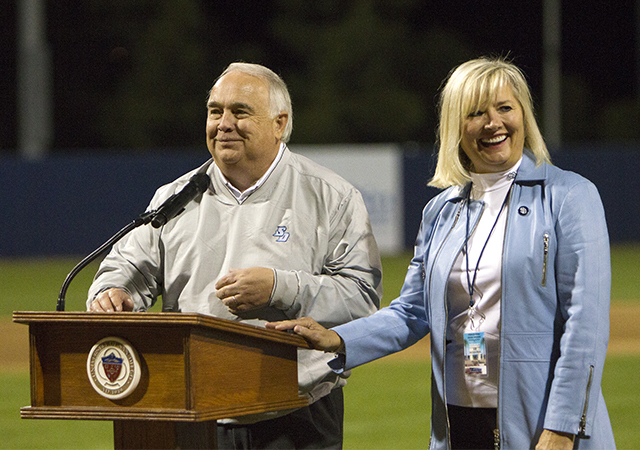 Through this program, USD’s connection to the community is evident. With visits to areas in San Diego, the week-long immersion provided students with the opportunity to meet people where they live and gain an understanding of their experiences.